Procatinator is a website that was designed for "cat lovers". But, after playing around on it for a while, and using it with Dotty, I finally concluded it could be an effective Alzheimer's caregiver tool. Is you loved one living with Alzheimer's driving you crazy today? 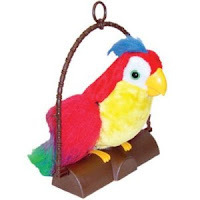 So far nothing comes close to Harvey the Repeat Parrot. Not even the talking lion which cost me 7 times what Harvey cost. However, here is a free service that might give you the pick me up you need, and could very well entertain your loved one for hours on end. This might not work for everyone, but it just might work for you. To try Procatinator click this link. Once you get to the website look for the link in the upper left that says, Show me another cat. To watch and listen to Dotty and Harvey go here. Or, go here to check out all of our videos of Dotty. To let us know your reaction to Procatinator, Harvey, and Dotty use the Add New Comment box below this article.